RightNow Media :: Streaming Video Bible Study : ONE: Why True Biblical Unity is Essential : Tom Kraeuter : Training Resources, Inc. In an age where hatred and divisiveness are so prevalent, the Church has an opportunity to demonstrate true unity and love in a profound way. Are we up to the task? In this series, you’ll discover – with the help of leaders from across the nation – why unity is vital for your congregation, what it should look like and how it can become a reality. Have you ever considered the possibility that your relationship with others in the Body of Christ could affect your relationship with God? Is it conceivable that our unity could impact our worship? According to Scripture, there is a direct connection. 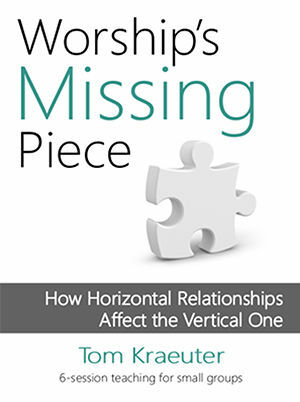 In Worship's Missing Piece, author and Bible teacher Tom Kraeuter offers six sessions for small groups, all focused on how our horizontal relationships affect the vertical one. You'll encounter great stories, powerful anecdotes, quotable quotes, and practical teaching, all based on God's Word. The Participant's Guide (order at www.worshipsmissingpiece.com) offers thorough outlines for each section, as well as discussion questions to help drive home the lessons. And, given the teaching style and the questions, we can pretty much guarantee some lively discussion after each lesson.